Sinatrafied in now a World Champion Three year old stallion at the AQHA quarter horse show! Congratulations to Elred Nehmelman, the proud owner of Sinatrafied. We are located on 20+ acres in Flora Vista, which is in the northwest corner of New Mexico. 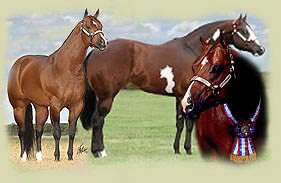 We offer a fine selection of world class quality APHA, AQHA halter and performance horses that are all for sale. We welcome visitors. Please call in advance so we can personally show you around. MR SINATRA - SOLD! Congratulations to Sheriff Stock Farm on the purchase of this great stallion! We are confident he will be a great asset to your program! Directions to Rockin' M., Inc.
Rockin' M., Inc., World Class APHA, AQHA, Halter & Performance Horses ~ All Rights Reserved.